As Concordia University Research Chair in Socially Engaged Art and Public Pedagogies, my teaching tends to dovetail with my research projects, working within what’s been called the “research-teaching” nexus. Iceland Field School, June 2020 and June 2018. An opportunity for students at all levels (BFA, MA or MFA, PhD) to earn 3 credits in an interdisciplinary Special Topics Course: ARTE 398/660/850: Imagining Iceland. Sited at the Icelandic Textile Centre in Blönduós, 250 kilometres northwest of Iceland, this course provides a framework for students’ exploration of questions of the role and responsibilities of the artist working within a foreign community and new context, museology of small institutions, community development, environmental considerations, responsible tourism and international hospitality, and more. 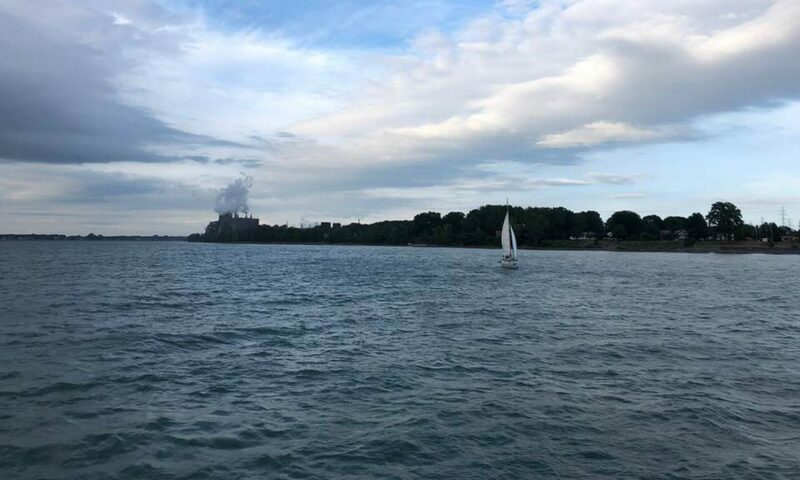 Each iteration, up to 13 students are selected based on their applications to create artistic and/or academic responses to this special context. *Links to my research into textile practices and cultural histories, particularly of wool, as well as into the role of the artist in contemporary society, especially in contexts experiencing stress. 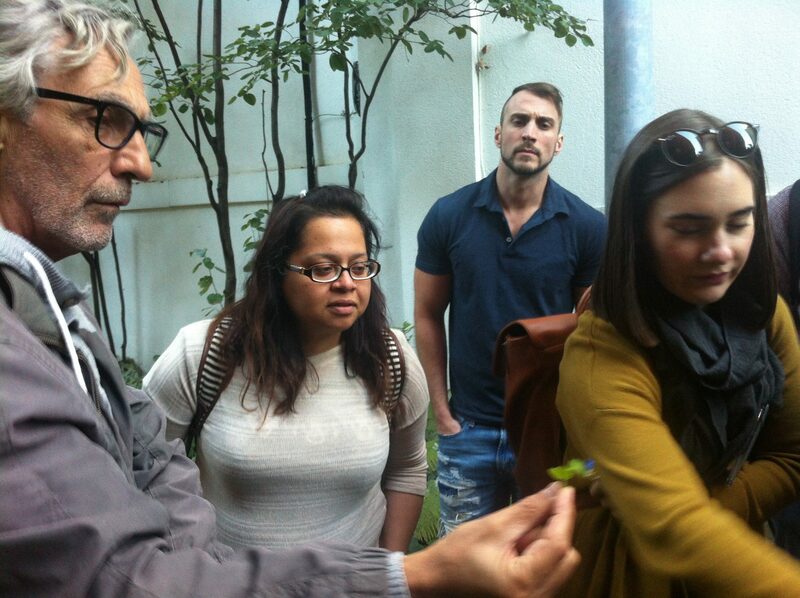 Urban naturalist extraordinaire Roger Latour (left) guides students through the neighbourhood around the Atwater Library, discovering how nature — in this case the Asiatic dayflower — thrives in the centre of the city. The Right to the City at the Atwater Library, Fall 2017. The ARTE 606/806 graduate (MA and PhD) studio seminar explores ‘place-based learning’ at the Atwater Library, an independent library, computer learning centre and meeting place about 15 minutes walk from Concordia’s downtown campus. Students are using personal and community-based creative projects to respond to the social, environmental and urban issues they see in play, exploring who has the right to the city in this neighbourhood experiencing rapid gentrification and densification. This iteration of “The Right to the City” links Art Education and History students in their investigations of this site, the latest version of the tethered teaching initiative developed in Pointe-St-Charles (2014-16) by collaborating faculty, Dr. Cynthia Hammond (Art History), Dr. Steven High (History), Dr. Ted Little (Theatre), and Dr. Kathleen Vaughan (Art Education). This is further described in the Gazette article and CBC Radio interview. *Links to my interests in social and environmental justice in the city, place-based creation and learning. 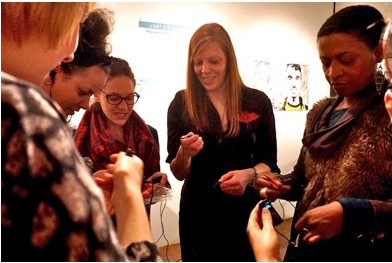 “Peace Trail” course member, BJ Lecours (centre), helps visitors to the Museum sync their MP3 players with the audioscape that introduced them to Isabey’s painting, “Burial at Sea” — during a 2016 Nuit Blanche event that served as precursor to the creation of the first audio guide. Creating the “Peace Trail” audio guide to the Montreal Museum of Fine Arts, Winter 2017. This special topics ARTE 660/850 seminar provided students with the opportunity to collaborate on the creation of an audio guide to the second floor of the Montreal Museum of Fine Art’s Pavilion for Peace, considering how ‘peace’ can reside in the baroque and Enlightenment collections. The project is rooted in the Museum’s humanist mission, which connects the institution to current social issues and the people who are engaged with them. Students worked together with expert sound engineer/mixer Philip Lichti to create Six Stories of Peace (and War) / Six histories de guerre (et paix), an hourlong visit to the collection. This is a companion project to the first audio guide, created during a Winter 2016 course and summer 2016 Independent Study cluster, which brings a lens of peace to works on the Pavilion’s first and third floors, via Four Artworks in Search of Peace / Quatre oeuvres en quête de paix. The “Peace Trail” audio guide project, proposed by Kathleen Vaughan in 2014, was selected by the Montreal Museum of Fine Arts Foundation for creation under the auspices of its recent partnership with Concordia University. *Links to my interests in the transformative possibilities of participatory art-making in museums and galleries.